Wingspan Update: New carpet at GSP! 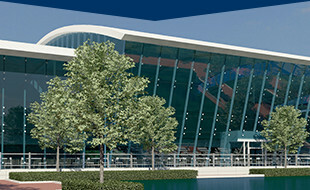 As part of the WINGSPAN renovations, GSP will be replacing all of the carpet in the airport. While we’re excited to have fresh, new carpet, we’re a little sad to say goodbye to the colorful designs of the old carpet. But not as sad as they were in Portland. 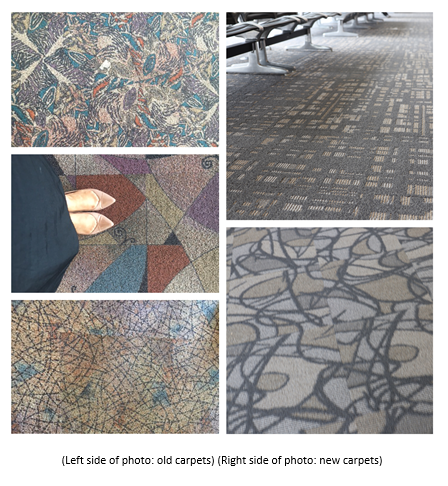 Portland International Airport’s old carpet has a fan base and people were outraged when it was pulled up and replaced last year. But it lives on in recycled goods and in the hearts of many Portlanders. The hipster carpet is so popular, that it even has its own social media accounts. The PDX carpet’s design has appeared on socks, sneakers, leggings, mugs, water bottles, neck ties, bike jerseys, beer-can holders and yes, even as tattoos. So, in honor of GSP’s carpet change we would like to highlight our own departing carpet. On the left side of the collage you will see the original carpet and on the right side you will see our newly installed carpet. Now, who’s ready to get matching carpet tattoos?